The late Unicoi resident, Jack Snider generously donated the land, now known as Jack Snider Park, to the Town of Unicoi. The Town of Unicoi put the land to good use by partnering with the U.S. Forest Service to create a walking trail that area residents could use and enjoy. Jack Snider Park is located at the base of Buffalo Mountain, conveniently located off of Exit 32 on I-26. The Town of Unicoi maintains a trailhead that offers public restrooms open to the public 24/7. The Pinnacle Trail is a nearly 5 mile hiking/biking trail that winds up Buffalo Mountain and leads to the renovated Pinnacle Fire Tower. The trail averages about a 7% grade and is mostly forest covered leading up to the tower. The tower once served as a lookout for the Cherokee National Forest, but since the renovation, it is now open to the public. The Pinnacle Tower offers visitors a 360-degree view of the surrounding areas, Unaka Mountain and the towns of Erwin and Unicoi. On a clear day, you can see both North Carolina and Virginia. 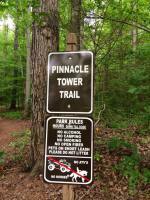 The Pinnacle Trail attracts many visitors to hike or bike the trail each week. Once making it to the top of Buffalo Mountain, visitors are in awe of the beauty that surrounds them. The view from the Pinnacle Fire Tower is beautiful and picturesque. Click here to view the photo gallery.